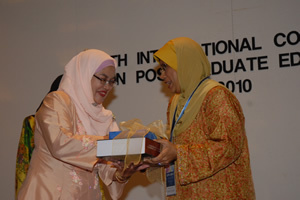 KUALA LUMPUR, 27 Nov. 2010 – There is a need for recognition of postgraduate students to be world citizens who can cross national boundaries without seeking to assimilate and homogenise but instead accept their differences thereby embracing diversity. Minister of Higher Education, Dato’ Seri Mohamed Khalid Nordin said today that there has been recognition of the importance of education as a vector of economic success, placing it high on the political agendas of many countries. Thus the international higher education community needed to produce qualifications that were recognisable in the international market. Higher education institutions worldwide needed to strengthen their international transparency and comparability of their qualifications. To achieve this ambition, there is a need to strengthen international transparency and comparability of the qualifications delivered by higher education institutions worldwide, he said. Opening the 4th International Conference for Postgraduate Education here today he said the Malaysian government recognising the enormous changes in the world’s economic, political, communication, social and cultural changes had taken swift initiatives to liberalise the postgraduate education scene . “Societies which grow intellectually can help build a society in which everybody – whatever their origin, background and level – can live together as equals in dignity,” he said in his speech read by Prof Dr Rose Alinda Alias, Dean of the Centre of Graduate Studies of University Technology Malaysia (UTM) who is also the chairperson of the Malaysian Deans of Graduate Studies (MyDEGs). The Conference is attended by academicians, researchers, graduate students and administrators from 22 higher education institutions. The two-day conference, organised by the Graduate School of Business and the Centre for Graduate Studies of University Kebangsaan Malaysia (UKM), will see the presentation of seven papers by experts and a forum on the issues of postgraduate education. 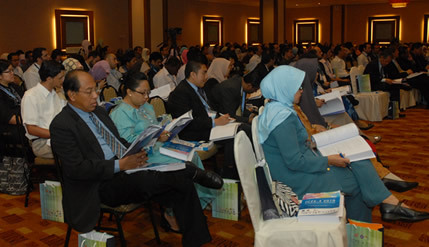 Among scholars attending the conference are Dr Christopher Hill of Nottingham University, Prof Geoffrey R. Tomlinson of University of Sheffield, Prof Dr Kuruntahan Ratnavelu of Universiti Malaya, Prof Dato Ir Dr Zaini Ujang of Universiti Teknologi Malaysia and Mr Kim Kihyoung of the National Research Foundation of Korea. Khalid said: it was the Malaywsian government’s firm belief that had it not allowed for the swift globalisation and liberation of its higher education system, Malaysia would have been left far behind. While education was a fundamental right, it was also a right not only in terms of access but also in terms of outcomes, he said. With universities increasingly seen as significant knowledge producers and thus as agents for economic growth and a knowledge economy, the minister said the government undertook several policy and legislative measures to enhance the global competitiveness of the country’s higher education system and make it a regional hub of education for international recognition of post degree studies. Commenting on the arrangement by the European Union (EU) under the Bologna Agreement effective this year where degrees awarded by any EU country is recognised in all EU countries, he said such recognition should be expanded to cover the whole world. With globalisation that is seen as a “force” more powerful than industrialisation, urbanisation and secularisation combined, he said they all recognised the importance of education as a vector of economic success, placing it high on their political agendas. Using the approach of liberalising the higher education sector rather than deregulation of its public universities in the mid 1990s, Khalid said the government introduced a series of legislations governing both the public and private higher education, namely, the Education Act 1996, the Private Higher Education Act 1996, the National Council on Higher Education Act 1996, the National Accreditation Board Act 1996 and the Universities and University Colleges (Amendment) Act 1996. The Private Education Act 1996 was then amended in 2003 with the precise intention of providing the legal framework in governing local private colleges upgrading to private universities as well as branch campuses set up by foreign universities in Malaysia. “The process of incorporation of public universities was to ensure that they become more self-financing, enter into business ventures, establish companies and consultancy firms, as well as acquire and hold investment shares,” said the minister. Under the favourable framework set out by the laws, the public universities not only began to franchise their programme to local private colleges but coupled with the development of flexible teaching, learning and research arrangements, they became more entrepreneurial. Khalid also said the establishment of the Ministry of Higher Education (MOHE) in 2004 ensured the governance of both public and private universities, while the National Higher Education Strategic Plan 2020 and the National Higher Education Action Plan 2007 to 2010 were introduced in August 2007 in response to the changing socio-economic and socio-political circumstances in the country. The minister said in pursuit of its ambitious goal, the government again amended the Universities and University Colleges Act significantly in December 2008 in order to further improve governance and reduce bureaucracy. It not only introduced more prominent professionals into the composition of public university board of directors but with its selection board would also appoint every Vice Chancellor of the public universities, who have the authority to extend the services of academics beyond their retirement age on a contractual basis. Swinburne University of Technology in Kuching (2002). Khalid said these four branch campuses run 84 programmes, while 19 other United Kingdom universities were conducting 110 twinning programmes that were accredited with the Malaysian Qualifications Register. In addition, 18 Australian universities were offering 71 twinning programmes, while institutions in countries like New Zealand, the United States of America, Egypt and Jordan were also offering such courses. On the spin-offs of the higher education sector, the minister said that having quality postgraduate students would assist the universities to concentrate on more research and development (R&D) projects which would ultimately benefit the nation. There would also be increases in tourism revenue, he added. Earlier, UKM Vice Chancellor Prof Tan Sri Dato’ Dr Sharifah Hapsah Syed Hasan Shahabudin in her welcoming remarks said academics needed to focus on universal values and frameworks to enable them to live in the world that is unfolding with relentless speed. 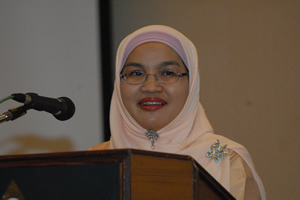 “Indeed, universities as knowledge producers, are an important impetus to creating a knowledge-based society and with increased transnational exchanges, globalisation should be embraced wholeheartedly,” she said in her speech read by Prof Dr Fauzias Mat Nor, Dean of the UKM Graduate School of Business. 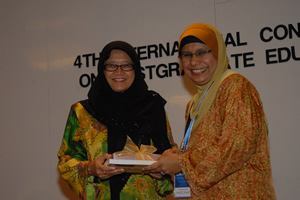 She also said that UKM itself was constantly engaged in an intensive process of reforms and re-shaping to ensure that it was agile in its response to the global needs, producing competent and ethical postgraduates, competing and collaborating in ways that would enhance the overall development of higher education in the region.